According to Christopher Callahan, dean of the Cronkite School, the new partnership prepares students for a variety of advanced reporting, legal, governmental and social service careers. 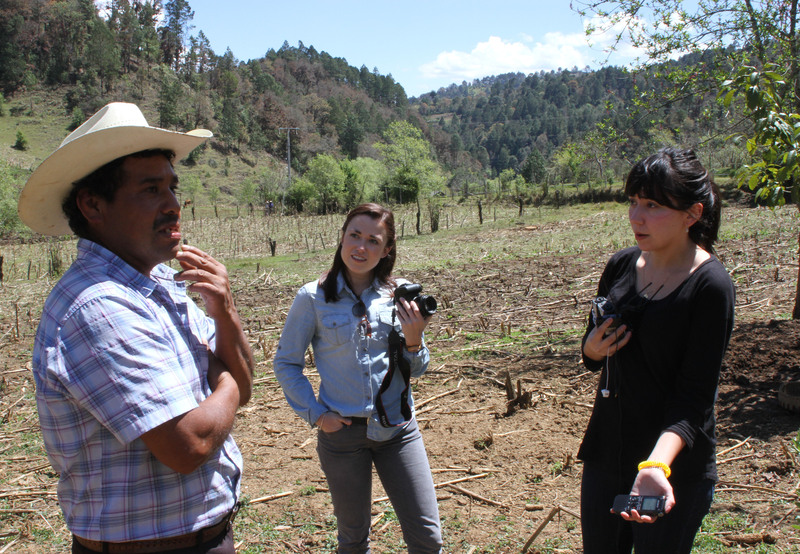 Students in the program choose from one of three different focus areas in the School of Transborder Studies: media and expressive culture; transborder community development and health; or U.S. and Mexican regional immigration policy and economy. At the Cronkite School, students take a variety of advanced journalism skills courses as well as a signature professional program, such as the Cronkite News daily newscast and website. Edward Escobar, acting director and associate professor of the School of Transborder Studies, said students graduating from the dual degree program will have enhanced career opportunities in working with the nation’s largest and fastest growing ethnic group. The Cronkite School announced the new dual degree program in February with a partnership with the Ira A. Fulton Schools of Engineering to offer dual degrees in journalism and graphic information technology in fall 2015. For more information on the dual degree program, visit cronkite.asu.edu/dual-degree-program. A series of Lunar Reconnaissance Orbiter Camera images have revealed a new crater and more than 200 related surficial changes up to 30 kilometers distant. The moon is pelted with cosmic debris all the time, but the largest explosion on its surface that we’ve actually recorded occurred two years ago today. On March 17, 2013, an object the size of a small boulder hit the surface in Mare Imbrium and exploded in a flash of light nearly 10 times as bright as anything ever recorded before. Since 2005, astronomers have monitored the moon for signs of explosions caused by meteoroids hitting its surface. When a meteoroid strikes the moon, a large portion of the impact energy goes into heat and excavating a crater; however, a small fraction goes into generating visible light, which results in a brilliant flash at the point of impact. The brightest flash recorded by researchers at NASA’s Marshall Space Flight Center occurred on March 17, 2013 with coordinates 20.6°N, 336.1°E. The team predicted the crater’s size based on the energy, and they eagerly awaited LROC’s next pass over the location to confirm their calculations. Being able to get observations before, during and after the impact is a valuable opportunity to understand impact events better. Comparing the actual size of the crater to the brightness of the flash helps validate impact models. LROC’s first set of post-impact flash images acquired on May 21, 2013 by the Narrow Angle Camera were targeted on the Marshall-reported coordinates, and numerous small surface disturbances (“splotches”) were detected by comparing the pre- and post-flash images, but no new crater was found. A second set of Narrow Angle Camera images was acquired on July 1, 2013 showing three faint, ray-like features and several chains of splotches and asymmetric splotches that generally pointed to a common area west of the Marshall coordinates. 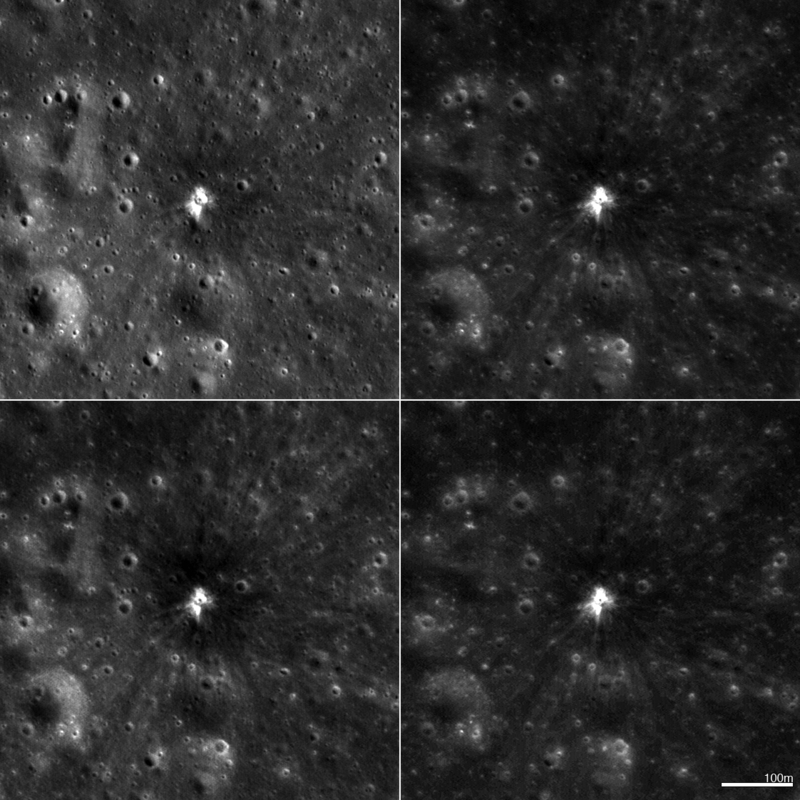 A Narrow Angle Camera pair was targeted on that convergence point for July 28, 2013; comparison of this third set of images with preexisting coverage revealed a new crater. The crater itself is small, measuring 18.8 meters (61.7 feet) in diameter, but its influence large; debris excavated by the sudden release of energy flew for hundreds of meters. More than 200 related surficial changes up to 30 kilometers (19 miles) away were noted. Not only did the LROC images reveal intricate details of ejecta distribution, but they also offered a valuable opportunity to study the structure of the top meter of the regolith. Regolith is a term that refers to a soil that is lacking organic material. The soil on the moon is formed slowly over time as micrometeorites impact the surface and slowly grind rocks into a fine powder. As the fresh soil grains sit on the surface, they are exposed to radiation and slowly become darker and redder (mostly due to reduction of iron in minerals to iron metal – reverse of rusting that happens on Earth). This slow change in reflectance and color is generally referred to as space weathering; fresh soil is referred to as immature, and weathered soil is mature. The longer a soil sits on the surface, the more mature it becomes. Several surprises were revealed in the before and after image pairs around the new crater. Conventional thought predicted that the new crater should be surrounded by a high reflectance ejecta blanket out to about a crater diameter with some patchy ejecta spreading out two or three diameters. “The high reflectance was there, but three other zones were discovered. At the edge of the high reflectance ejecta was a low reflectance zone, then, beyond that, another high reflectance zone, and beyond that, another low reflectance zone,” reports Mark Robinson, a professor in ASU’s School of Earth and Space Exploration and LROC’s principal investigator. The results are published in the Jan. 31 edition of the journal Icarus. It’s not easy to find new impact craters because most of them are very small. The only way to really do this is to have a before image and an after image to compare. LROC began systematically mapping the moon in the summer of 2009. Now, the team is going back to images taken in the first year or two and comparing them to recent images. Called temporal pairs, these before/after images enable the search for a range of surface changes, including new impact craters formed between the time the first and second image were acquired. As of Jan. 1, 2015, LROC has acquired about 10,000 before and after image pairs. Manual scanning of all these pairs is impractical so Robinson’s team developed a computer program that automatically identifies suspected changes from each temporal pair. With the help of the automated tool, the team has identified 225 new impact craters ranging in size from 1.5 meters to 43 meters (4.9 feet to 140 feet) and over 25,000 small changes known as “splotches” (likely unresolved primary and secondary craters).